MotoGP Race Director Paul Butler has confirmed to MCN he came close to red flagging last Sunday’s Italian GP to avoid a potentially disastrous track invasion before the end of the 23-lap race. Butler faced the tough call as he’d noticed on circuit TV cameras fans, who had breached perimeter fencing, were edging dangerously close to the track with two laps still remaining of Sunday’s race. 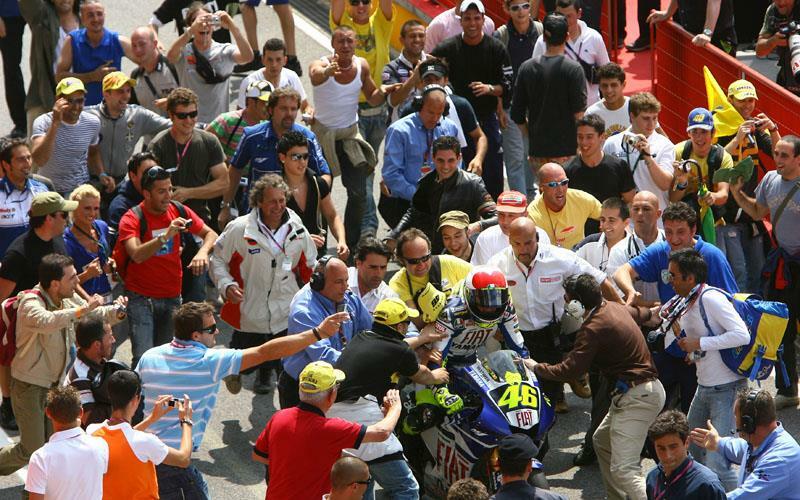 By the time home favourite Valentino Rossi had crossed the line to take his sixth straight victory in Mugello, fans were already swarming onto the track on the approach to the first corner as the rest of the field crossed the finishing line at close to 200mph. Butler admitted in an exclusive interview with MCN he had nearly red flagged the race. “I had a choice towards the end as to whether to red flag or not but in view of the make up of the back of the field it was a difficult call because it could have been more dangerous to red flag and risk an invasion, whereas notionally they would wait until Valentino had crossed the line. “That was a judgement call that the Clerk of the Course and I had to make and we decided to finish the race and fortunately it came off, but obviously we don’t want to be that situation again. “I’d considered red flagging it at the end of the penultimate lap. At that stage without any direct security control in the area it was a difficult call. “But the call was that we would let the race run its course and then show yellow flags from the finish line all the way round the first corner so the other riders would see those yellows as they approached the chequered flag and hopefully back off and that’s what happened,” said Butler. Sunday’s invasion was not a new occurrence in Mugello, and the circuit has been issued with stern warnings in the past by the FIM failure to control crowds could even see the popular event axed off the calendar. In previous years Yamaha rider Norick Abe fell off when grabbed by fans, who will stop at no means to invade the circuit, including using wire cutters to slice through the trackside fencing. The issue was raised in a post mortem of the day’s events on Sunday evening, though Butler said no rider had directly approached him after the race. Butler added: “Five years ago they were actually requested or there was a demand from the FIM in order that they should continue to get the race. That was to do something about the fencing, which they did. “If you look at it you will see a double line of very high fencing. There’s now a vacant space of about 10-metre between two rows of wire fencing and they have wire on top. They actually delivered on that and we have not had a problem for the last couple of years of any serious nature. “That’s because we had an arrangement in place that fans will be allowed, once the last rider has crossed the line, to enjoy the podium ceremony from trackside while everybody is protecting the pitlane. After previous security breaches at Mugello and the consequent measures taken to avoid a repeat, Sunday’s incident shows there is still much work to be done. And Butler said it was hard to decipher what preventative measures could be taken to avoid riders being placed at such high risk in future Mugello races. “I don’t know. You rely on the fans being sporting enough and intelligent enough not to impose any danger through their actions on the competitors. “A lot of communication goes into that. I know Mugello spent many hundreds of thousands of pounds on fencing and yet it's not doing the job, so that’s why we are looking at the whole package to see how we can prevent it happening next year. “It’s wonderful that the fans are extremely joyous and celebrate the whole thing in good part once in front of the podium but the control in the critical moments at the end of the race is fundamental,” added Butler.